The aim of the present study was to confirm and compare the ability of MTAD and aqueous ethylene diamine tetra-acetic acid (EDTA) to remove the smear layer. In addition, their effects on peritubular and intertubular dentinal structures were examined by scanning electron microscopy (SEM). Thirty recently extracted maxillary and mandibular single-rooted human teeth with relatively straight roots were used in this study. All teeth were randomly divided into 3 groups containing 10 teeth each. In this group, normal saline and 1.3% sodium hypochlorite were used alternately as irrigants during instrumentation. A 17% aqueous solution of EDTA was used as the final rinse per the manufacturer's instructions (Dent Wash-Prime Dental, India) followed by 1.3% sodium hypochlorite. In this group, distilled water was used as an irrigant during instrumentation and as the final rinse. This group served as the positive control. No smear layer. No smear layer on the surface of the root canals: all tubules were clean and open. Moderate smear layer. No smear layer on the surface of the root canal, but tubules contained debris. Heavy smear layer. Smear layer covered the root canal surface and the tubules. No erosion. All tubules looked normal in appearance and size. Moderate erosion. The peritubular dentin was eroded. Severe erosion. The intertubular dentin was destroyed, and tubules were connected with each other. The data was then subjected to statistical analysis using Fisher's Exact Test and Likelihood Ratio. The samples in Group 1 (MTAD) showed complete removal of the smear layer in 90% of specimens in the coronal and middle areas, and 100% of specimens in the apical area. Partial removal of the smear layer was noted in the remaining specimens in both coronal and middle portions [Figure 1]a-c. The specimens in Group 2 (EDTA) showed complete removal of the smear layer in 80% of samples in both coronal and middle areas, and 50% of specimens in the apical area. Partial removal of the smear layer was noted in the remaining specimens in coronal, middle, and apical areas [Figure 2]a-c. None of the samples in groups 1 and 2 showed the presence of a heavy smear layer. Distilled water in Group 3 samples was unable to remove the smear layer. A heavy smear layer was noted in all the specimens in this group [Figure 3]a-c. When evaluating the degree of erosion, no erosion was noted in all the specimens in the coronal and middle areas of samples treated with MTAD. In apical areas, only 10% of specimens treated with MTAD showed some erosion, whereas the remaining specimens were normal [Figure 1]a-c. In samples treated with EDTA, normal tubules were noted in 50% of specimens in both coronal and middle areas, and 80% of specimens in the apical areas. Moderate erosion was noted in 20% of specimens in coronal and apical areas, and 50% of specimens in the middle area. A severe degree of erosion was noted in 30% of specimens in the coronal area of samples treated with EDTA [Figure 2]a-c.
No statistically significant difference was found between MTAD and EDTA groups when the ability of these 2 solutions was compared in the coronal and middle areas of the specimens (P = 1.000). In the apical area, a statistically significant difference was found between MTAD and EDTA groups (P = 0.033). A statistically significant difference was found between MTAD and EDTA groups when the degree of erosion in the coronal and middle areas was compared (P = 0.013 and 0.033, respectively). No statistically significant difference was found between MTAD and EDTA groups in the apical area (P = 1.000) when the degrees of erosion were compared. 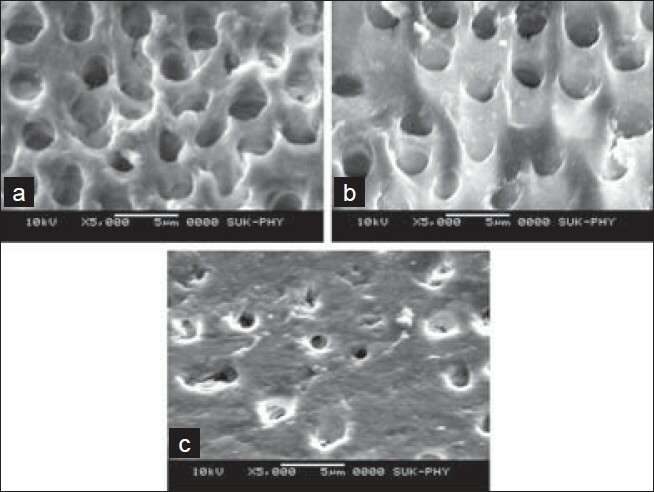 The present study was carried out to compare the ability of MTAD and EDTA to remove the smear layer, as well as to examine their effects on peritubular and intertubular dentinal structure with an SEM. Results of the present study showed that in Group 1, where a combination of NaOCl and MTAD was used, most root surfaces in coronal, middle, and apical thirds had no smear layer. The coronal and middle third areas showed a complete smear layer removal in 9 out of 10 specimens. A moderate smear layer was seen in one specimen. The apical third showed complete smear removal in all the specimens. These findings are in agreement with a study conducted by Torabinejad et al. In that study, of 10 samples irrigated with 1.3% NaOCl and MTAD, 27 out of 30 root canal surfaces exhibited complete smear layer removal. A moderate smear layer was observed in these regions for the remaining samples. Our results are also in agreement with another study by Torabinejad et al, in which the surfaces of root canals and dentinal tubules in the coronal, middle, and apical thirds of all 12 samples tested were found to be free from debris. In Group 2, where a combination of NaOCl and 17% EDTA was used, coronal and middle third areas showed complete smear layer removal in 8 out of 10 specimens (80%). A moderate smear layer was observed in these regions for the remaining specimens. Five out of 10 specimens (50%) in the apical third showed a complete smear layer removal. Results of the present study are in agreement with an unpublished study by Shaligram. He used liquid EDTA for smear layer removal in his study carried out at Government Dental College and Hospital, Aurangabad and found complete smear removal in 96% of specimens in the coronal third, 74% of specimens in the middle third and 55% of specimens in the apical third. Our findings also corroborate the findings of Torabinejad et al, which noted no smear layer in 70% of root surfaces in coronal and middle thirds. A moderate smear layer was observed on 80% of surfaces in the apical third with 20% of surfaces showing complete smear removal. The smear layer removal action of EDTA can be attributed to its chelation action on the root canal. The moderate smear removal observed in the apical third may be due to incomplete penetration of EDTA in the apical area of the root canal. In the EDTA group, normal tubules (no erosion) were noted in 5 specimens in both coronal and middle areas, and 8 specimens in apical areas. A moderate degree of erosion was noted in 2 specimens in coronal and apical areas, and 5 specimens in the middle area. A severe degree of erosion was noted in 3 specimens in the coronal area. Based on our findings it appears that MTAD is an efficient solution for the removal of the smear layer, especially in the apical third of root canals, and does not significantly change the structure of the dentinal tubules. 1. Czonstkowsky M, Edmund G, Wilson Holstein FA. The smear layer in endodontics. Dent Clin North Am 1990;34:13-25. 2. Sen BH, Wesselink PR, Turkun M. The smear layer: A phenomenon in root canal therapy. Int Endod J 1995;28:141-8. 3. Torabinejad M, Handysides R, Khademi A, Bakland LK. Clinical implications of the smear layer in endodontics: A review. Oral Surg Oral Med Oral Path Oral Radiol Endod 2002;94:658-66. 4. Aktener BO, Cengiz T, Piskin B. 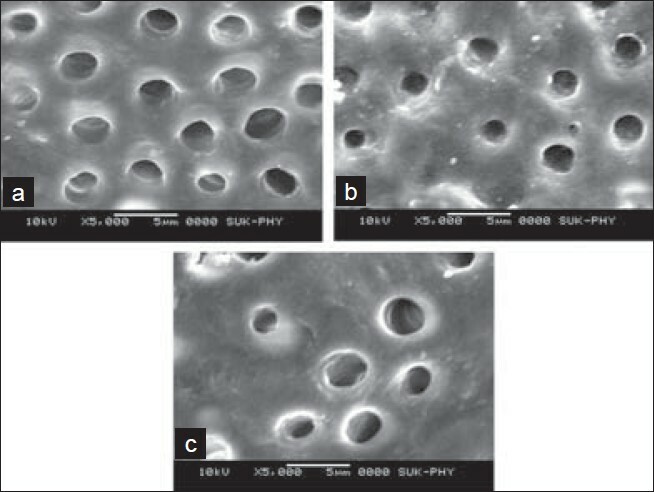 The penetration of smear layer into dentinal tubules during instrumentation with surface active reagents: A scanning electron microscopic study. J Endod 1989;15:588-90. 5. Gutiérrez JH, Herrera VR, Berg EH, Villena F, Jofré A. The risk of intentional dissolution of the smear layer after mechanical preparation of root canals. Oral Surg Oral Med Oral Pathol 1990;70:96-108. 6. Mader CL, Baumgartner JC, Peters DD. Scanning electron microscopic investigation of the smeared layer on root canal walls. J Endod 1984;10:477-83. 7. Barkhordar RA, Watanabe LG, Marshall GW, Hussain MZ. Removal of intracanal smear by doxycycline in vitro. Oral Surg Oral Med Oral Pathol and Endod 1997;84:420-3. 8. Baumgartner C, Mader C. A scanning electron microscopic evaluation of four root canal irrigation regimens. J Endod 1987;13:147-57. 9. Berg MS, Jacobsen EL, BeGole EA, Remeikis NA. 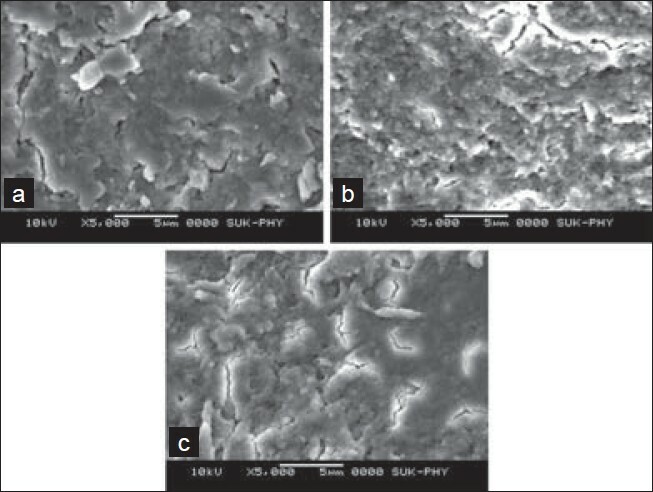 A comparison of five irrigating solutions: A scanning electron microscopic study. J Endod 1986;12:192-7. 10. Ciucchi B, Khettabi M. The effectiveness of different endodontic irrigation procedures on the removal of the smear layer: A scanning electron microscopic study. Int Endod J 1989;22:21-8. 11. Hülsmann M, Heckendorff M, Lennon A. Chelating agents in the root canal treatment: Mode of action and indications for their use. Int Endod J 2003;36:810-30. 13. Aktener BO, Bilkay U. Smear layer removal with different concentration of EDTA- Ethylenediamine mixtures. J Endod 1993;19:228-31. 14. Cengiz T, Aktener BO, Piskin B. The effect of dentinal tubule orientation on the removal of smear layer by root canal irrigants. A scanning electron microscopic study. Int Endod J 1990;23:163-71. 15. Torabinejad M, Cho Y, Khademi AA, Bakland LK, Shabahang S. The Effect of Various Concentrations of Sodium Hypochlorite on the Ability of MTAD to Remove the Smear Layer. J Endod 2003;29:233-9. 16. Shaligram A. Comparative in vitro evaluation of commercially available liquid and cream preparation of EDTA in removing smear layer from prepared root canal walls. An SEM study. MDS Thesis. Aurangabad, India: B.A.M. University; 2003. 17. Garberoglio R, Becce C. Smear layer removal by root canal irrigants. Oral Surg Oral Med Oral Pathol 1994;78:359-67. 18. Haznedaroglu F. Efficacy of various concentrations of citric acid at different pH values for smear layer removal Oral Surg Oral Med Oral Pathol and Endod 2003;96:340-4. 19. Calt S, Serper A. Time-dependent effects of EDTA on dentin structures. J Endod 2002;28:17-9. 20. Niu W, Yoshioka T, Kobayashi C, Suda H. A Scanning electron microscopy study of dentinal erosion by final irrigation with EDTA and NaOCl solutions. Int Endod J 2002;35:934-9. 21. Park DS, Torabinejad M., Shabahang S. The effect of MTAD on the coronal leakage of obturated root canals. J Endod 2004;30:890-2. 22. Machnick T, Torabinejad M, Munoz C, Shabahang S. Effect of MTAD on Flexural Strength and Modulus of Elasticity of Dentin. J Endod 2003;29:747-50.